Happy Friday! I think we’re on our way to the greenhouse today, I don’t need a lot of extras this year as my perennials are really doing well and take up most of the space now, but we need tomatoes and a few things for hanging plants and pots. We go to a greenhouse just south of the city that has excellent plants and a better price than I can get locally. I might be on the lookout for some geraniums to plant in my pots. I am always looking for that bright bit of colour that will tolerate the sun and heat, and geraniums are great for that. This lovely geranium is from Power Poppy’s Geranium Take Two (back in stock soon!). I wanted to give it a really warm and earthy look, so I added some spashy watercolouring with my Inktense pencils and a water brush in a really loose style, allowing for a little spash and splatter here and there. I love how it turned out! I’m such a girl for vivid colour, but this time I was smart and really played down the rest of the card with layers of neutrals, so the red of the geraniums really stands out. A little sewing, some ink distressing, a little lace and satin ribbon and some wood buttons complete the design. 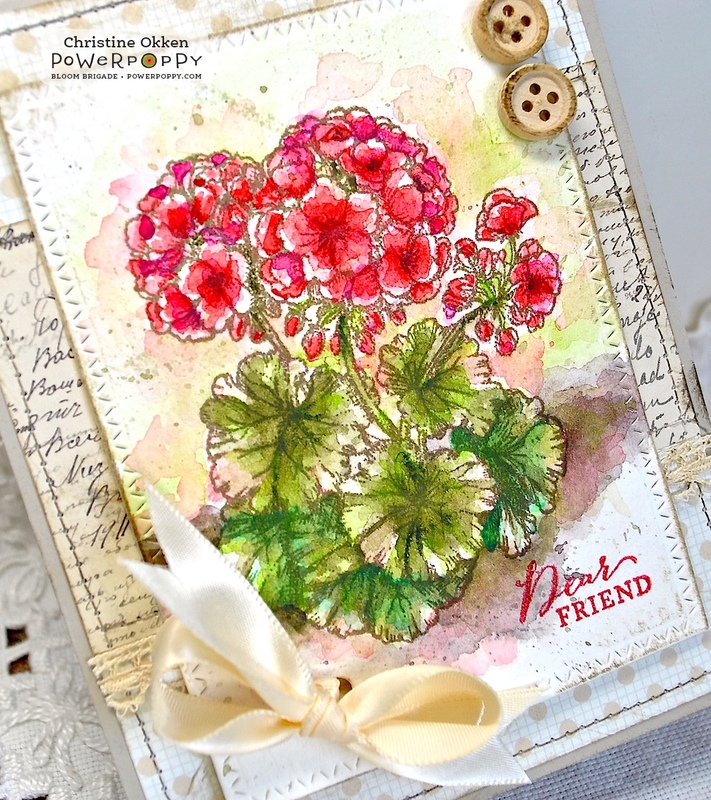 I did add a little on the inside with the other pretty trailing geranium from the set and another pop of red. 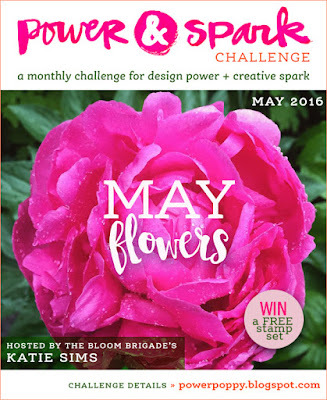 I’m adding this to my May Flowers repetoire and the Power & Spark Challenge at Power Poppy. Have you jumped in yet? 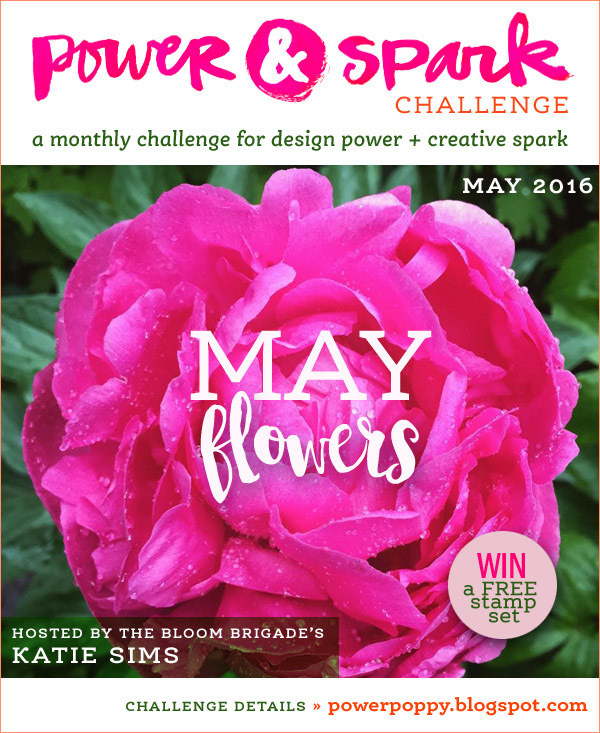 You could win a set of your choice from the store and stamp some new May flowers that won’t need watering, or weeding for that matter! gorgeous card Christine and fantastic colouring it looks so real. This is most amazing, Christine! I'm completely enthralled. Love, love, LOVE your earthy watercoloring. WOW! Oh, Christine, this is gorgeous, and I struggle with watercoloring loosely. But this sure is inspiration, because it is amazing and is so beautiful with the layout and the gorgeous DP you've used! I love the stitching and the buttons -- and of course the beautiful bow! Truly a gorgeous card that I can hope to aspire to!! Hugs, sweet friend! Absolutely beautiful design Ms. Christine! Love the dreamy watercolor wash you so perfectly added! I love this, Christine!! The watery splashes and pooling, I have no idea how to accomplish thislook...but I may have to n est in some inktense pencils. 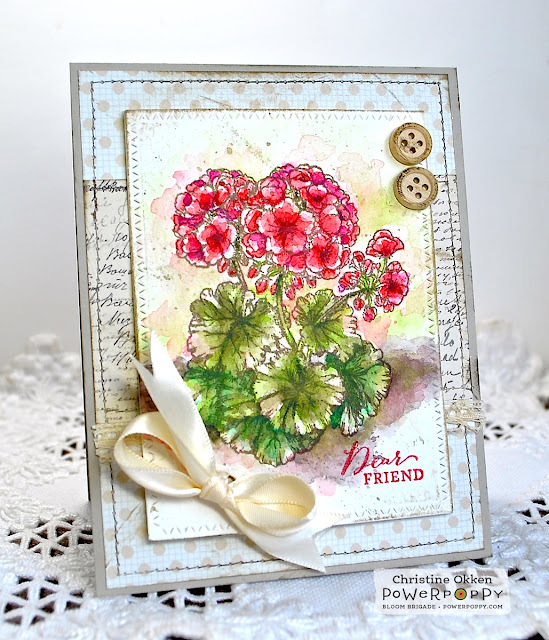 I am glad you let the geraniums take center stage...just a Wow card!! 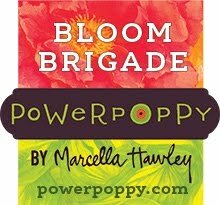 I still need to plant some flowers, too! Thanks for sharing as always! Wow, absolutely gorgeous Christine! Love your earthy tone water colouring, it looks like a painting. Love this!! Beautiful Christine! The red really does pop against the softer cream colors. I just love the stitching too. Beautiful! OH MY Christine AHmazing girly. Is there anything you can't do!?!?! This is incredibly gorgeous Christine!! Not just your watercoloring...which is out of this world...but the papers and embellishing you used to enhance your image couldn't be more perfect!! Everything works so beautifully to tell a lovely story! Wow!! So beautiful Christine, I love looking at your gorgeous creations. It's so inspiring, something to work towards. Oh my Beautifully colored, love the stitching and papers to go with it! Oh Christine! This is just heavenly! 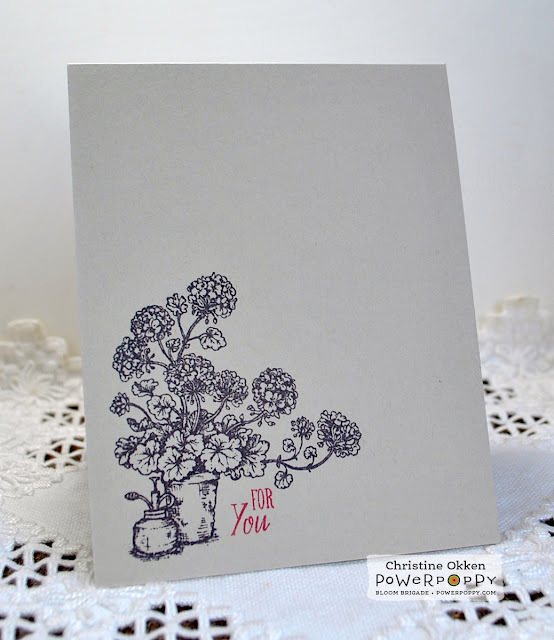 I so love the water colour feel of this card! Those geraniums are amazing! They just pop off that page!